And I just HAD to find out what it was all about! ASAP! I was reading many books at the time and I just abandoned all of them to focus on Warcross and boy was it a GREAT decision! I had never read anything by Marie Lu although I was planning to because I’ve seen mad reviews about her Young Elites trilogy. I was craving something that was action-packed and that’s exactly what I got! First of all, through one book, Marie Lu has managed to do so much! It had the right dosage of mystery, of sci-fi and even of romance (even though I was not a big fan of the latter)! But the world-building though… It all revolves around the world-building for me because it was AMAZING. I remember that whenever I’d put the book down, I’ve started imagining life as it is in Warcross. It reminded me a lot of League of Legends which I used to play and also Quidditch but LoL next to Warcross was nothing but children’s games really. I was fascinated by the universe and how the author has managed to paint a pretty vivid image of it. There were plenty of Warcross games described and I loved how each game had its own scenery and that you’d easily start imagining it while reading the book. The world is brilliant. I feel like I’ve gone to the future and now I really need technology to give me something like what’s in Warcross! Warcross featured a real diverse set of characters which is a really great thing. I was very surprised to have an asian girl with RAINBOW colored hair as an MC. I instantly fell in love with her and now, a few days later, I’m considering to dye my own hair for the first time! I want to be Emika so bad but sadly, I don’t think I’m badass enough to rock rainbow hair and I have no idea how to code 😭. I love the relationship she had with her dad though! I think, even though he was not entirely a good person as he gambled and left his daughter with loads of debts to pay, that he was a great parent to her. He taught her to never give up and to always try to see the bigger picture to solve any problem she encounters. Of course, there are tons of other characters that I loved, especially from the Phoenix Riders members. They were all so very welcoming and did their best to make the team work well together. I loved how Hammie was a bit protective of her. Also, Asher, who’s a person with disabilities, is one hell of a captain and I really admired how he managed to lead his team. They all grew into a family and I can’t wait to read what’s coming! On the other hand, I did not really like Hideo. The kid who suddenly becomes millionaire because of awesome abilities, who’s dark and mysterious but ends up having actual feelings and blah blah blah. I did like the relationship he has with his parents but perhaps what made me dislike him was the whole romance situation he had going on. As an action packed book, I really did not need the romance bits and I just kept rolling my eyes at everything. The whole book was very action packed and felt more like watching an action futuristic movie. It’s very fast-paced and you get through it so fast. Again, the world being so amazing, it just wanted you to devour every little detail about it and to feel yourself in it. Sadly, it was a tad predictable which was a bit underwhelming but it didn’t affect my satisfaction real bad and so it didn’t take away from the story for me. All in all, Warcross has been not just an amazing read but an amazing experience. It has also made me think about the effects of technology in our lives. How much technology is too much? If you’re looking for an entertaining, thought-provoking read with an amazing world and badass characters, then Warcross is the book for you! Hope you’ve enjoyed this review! Let me know if you’ve read it and what did you think of it. Did you also end up craving a world like Warcross? Review | This is what I’ll call a beautiful book. I’ve never heard of Jesmyn Ward before picking up this book but apparently she has won the National Book Award for her book “Salvage the Bones” and “Sing, Unburied, Sing” just showed me how she clearly deserved it. Now I haven’t read her other book but this kind of writing can’t be an overnight thing. She has such a marvelous and unique writing style that can’t let you be indifferent. I gotta admit, though, that I found the first scene where they were slaughtering a goat unnecessary and it was a bit too gory for me. Not that I’m not used to gory things, I just don’t feel like reading about them. The book talks about abuse, love, family, race, drug addiction and much more. It’s not an easy read and can break your heart in so many ways because it tells you about the history of black people in the US and the pain they had endured, about how giving birth to a child doesn’t necessarily mean ending up being a good parent, about the biggest regrets of a lifetime, about a dying parent and so on. It tells you all of these things in a style that grips you and literally forces you to feel every tiny detail. There is a lot packed in 304 pages and Jesmyn Ward does an amazing job at including the reader in the story. There are some scenes with so much tension that I hardly manage to put the book down. I’ve read the book in two sittings and it’s only because I had to sleep because I had a 24h shift the next day. The language is very beautiful and very poetic and was able to set a strong mood for me while reading it. I did not feel much like I was reading but more like I was in the scene, watching everything. The story is told from the viewpoint of Leonie, the mother and Jojo, her son. We also get the viewpoint of Richard (a prisoner that Jojo’s grandfather was talking about) after a while but the main ones we get are Leonie’s and Jojo’s. I could not help but feel for the characters and care about them. They’re all so very real, flawed and make horrible mistakes. Only once you get to read about them and know them a bit more, you get to actually understand them and that’s what happened for me in a way while I was reading Leonie’s chapters. I don’t know why many people haven’t enjoyed Leonie’s point of view but personally I really liked her POV better than any other. It showed how she was tormented, that she was trying to be a good mother but just could not express her feelings the way she wanted and that it was all too late to save the relationship she had with her son and daughter. It also showed how she was still affected by the murder of her brother that she was still seeing whenever she got high. I know that nothing excuses being a bad mother but the way Jesmyn Ward describes her makes you a tiny bit sympathetic towards her, especially in those scenes with her mother that is bedridden because of cancer. The characters are really not ones to forget easily. I loved every single one of them apart from Michael, their dad and of course, his parents. They are what’s wrong with the world: racists and know nothing about responsibility. There were a few flaws but they didn’t take out much from the story and it really depends on preferences. I wasn’t the biggest fan of the magical realism that was added but I let it slide although it felt a bit distracting in my opinion. All in all, this was a beautifully written, gut wrenching read. If that’s what you’re looking for then I highly recommend it. Street-thief Tina breaks in to the luxurious house where her mother was killed to steal from Mr. Greyhill and nail him for her mother’s murder. She is caught red-handed.Saved by Mr. Greyhill’s gorgeous son, Michael, the pair set in motion a cascade of dangerous events that lead them deeper into the mystery, and reveal dark and shocking secrets from Tina’s past. Review | After reading other reviews, I have realized that many people said that this book was falsely advertised as a thriller while it wasn’t one, comparing it to Gone Girl and The Girl with The Dragon Tattoo. Personally, I have not read the latter but I didn’t see any resemblance with Gone Girl. I saw the mystery part but I didn’t see the thriller. It didn’t affect my judgement though because when I’ve received it through Netgalley, nothing said Gone Girl in the description and so I wasn’t expecting anything besides what was written there. I don’t exactly like reading too much about a book before actually reading it. Anyways, now onto the book. I think I have started to develop a thing for books set in Africa. I usually visualize everything with a punch of colors and a lot of “life”. It’s the reason why I’ve picked this book right after Stay With Me. I really needed more and I felt so ignorant towards other cultures that I thought now’s the time to learn! Unfortunately, I was quite disappointed. Now don’t get me wrong, I didn’t hate the book and as you can see from my rating, I ended up liking it! Only, not as much as I thought I would. The story is very good and it has a lot of potential. It could’ve been a lot more better if it weren’t for the pace, how predictable it was and the ending that wasn’t satisfying enough and too neat for my taste. I really enjoyed the writing which is why I kept on reading. Although the pace was very slow for the first half of the book, it began picking up on some speed later on and that’s where the book started becoming fun. I also felt that there could’ve been loads of content removed from the book and it would’ve actually made it better. It had a few action/suspense scenes here and there that were really good but seeing the length of the book and how it went on describing things that weren’t really relevant, they weren’t enough. Moreover, thanks to the clues the author gives us, we can easily guess what’s going to come next apart from one or two things that came as a surprise. One thing I did like was how the characters were really diverse and how it tackled difficult topics such as war, experiences of refugees, corruption and so on. I loved Tina and how she was determined to avenge her mother and sacrifice everything for her little sister. She and Boyboy were definitely my favorite characters. And especially Boyboy who’s so sassy and steals the show every time he’s in a scene! One thing I did not like was the last minute romance with Tina and Michael that was added to the book. It wasn’t necessary at all! Overall, this is a really great book with the writing and setting being its strongest qualities. If you’re looking for a book that’s an easy and enjoyable read that will keep you at the edge of your seat while still dealing with “mature” topics, this is the one for you! I hope you’re having a great week! I just wanted to say real quickly that I am trying to change the format of my reviews and I’m also thinking about changing the overall look of this blog (again). I am still experimenting so I am sorry if this hurts the eyes a bit but I have a specific layout in mind that I want to start applying, I’m just still trying to figure out how. 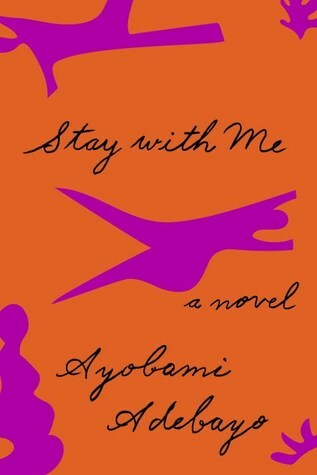 For the Booktube-A-Thon, I chose to read Stay With Me which is probably the best book I’ve read so far this year. Review | The short version: This is not sponsored by Nike but: Just Do It. Read it. ASAP! And if you’re still not convinced, here’s the longer version: When I heard that this was shortlisted for the Baileys Women’s Prize for Fiction, I was really excited about it and reading the synopsis just made me know that this will be one of my favourite reads of 2017. This book is no simple book. It’s an adventure! I don’t exactly know how to talk about this book without getting into any spoilers but I’m going to try to. This book is packed with twists! Like, as soon as you start to move on from something, something else comes to surprise you even more. Infertility is a global health issue. Although a lot of people are ashamed to bring it up, it is there and a lot of people are trying real hard to conceive a child. In this book, the main characters are fighting the same battle. Only their families were also involved in this battle by pressuring Akin, the husband, to take on a second wife that will be able to give them the grandchild they’ve all been waiting for. This is something that has angered me SO BAD. I absolutely hate it when parents are trying to get in their son’s or daughter’s marriage and try to destroy it. It’s something that I’ve seen both in fiction and in real life and it just angers me. Besides, it’s not like Yejide (the wife) didn’t want children and didn’t do anything about it! She was really trying so hard on her side as well. She still ended up being forced to accept Akin’s second wife. And that’s the point where mistakes and really bad things started to happen. It’s also where I got so invested into the story in a way that made me read that second part of the book in one sitting. The book being quite short, the writing had to be very simple and straight to the point because although the book was short, it contained so much. It wasn’t too simple in a way that will make you feel that it was bland. On the contrary! It has a very nice flow to it and it won’t leave you be uninterested by the characters and what’s happening. I also loved the fact that we were able to get Akin’s version of the story and Yejide’s too. Both characters are flawed, they both made mistakes and I really hated one of the characters at first but then my point of view changed completely after hearing them out. And since there were so many twists, I just kept needing more and more. I was never able to predict what was going to happen next and it’s exactly what I’m usually looking for in books. Although, to be honest, I wasn’t expecting this multiple-twists thing to be in a literary fiction novel that talked about a marriage that was on the brink of getting destroyed. I think that aside from all the twists, what really kept me invested in the story was that the characters felt real. I was taken in a Nigerian home and got to know about their day to day lives. I liked googling all the food and the historical events (to check if they’re true or fictional, that’s something I do with all books) in there and I specifically liked the sound of Moin-Moin which I kept repeating for a week. Throughout this book we also get to learn about the military coup that happened during 1985 led by the Major Babangida. I loved how this book took me to Nigeria and made me learn a bit about its food and its history. I didn’t know much but clearly Nigeria has fought a lot to shift towards a democratic government. Of course, the book isn’t only focused on that. What was also interesting was also knowing about the Yoruba people and their customs and beliefs. It just made me realize how really diverse our world is and the answer is A LOT. I am looking forward to having similar experiences with other books whose main characters have different backgrounds. Yejide is a really strong, smart and opinionated woman. She might have made a few mistakes but no one is perfect. She was still my favorite character because she was compassionate and didn’t give up. She has only given up when she shouldn’t have but she still went a long way because while being modern, she couldn’t keep up with all the traditions at first and that was really hard on her. I felt really sad for her relationship with Akin getting weaker and weaker but it couldn’t have gone any other way. I loved their conversations once Yejide realized Akin has taken a second wife. I loved how she kept snapping back at him. It was hilarious! There were a few flaws but they didn’t take out much from the story and it really depends on preferences. For example, although I really enjoyed all the twists and turns this book has taken, I found it a bit rushed. Perhaps if the book was a bit longer, it would’ve been better. It may also give the impression that it was unrealistic but having heard a few similar stories to this that have happened in real life, I didn’t think twice about this detail. I can’t invalidate someone’s story just because it doesn’t sound realistic to me. Also, at the start of every chapter, we never really know who’s speaking. Whether it was Akin or Yejide and although it gets clearer when we get to know the characters better, I would’ve liked a little notice at the beginning because I didn’t know there were multiple points of view in the book. All in all, this was an amazing gut wrenching read. I highly recommend it, even more if you’ve read Homegoing and enjoyed it. In this masterful novel by the acclaimed Indian writer Vivek Shanbhag, a close-knit family is delivered from near-destitution to sudden wealth after the narrator’s uncle founds a successful spice company. As the narrator – a sensitive young man who is never named – along with his sister, his parents, and his uncle move from a cramped, ant-infested shack to a larger house and encounter newfound wealth, the family dynamics begin to shift. Allegiances and desires realign; marriages are arranged and begin to falter; and conflict brews ominously in the background. Their world becomes ‘ghachar ghochar‘ – a nonsense phrase that, to the narrator, comes to mean something entangled beyond repair. 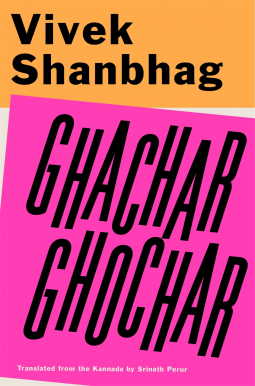 Told in clean, urgent prose, and punctuated by moments of unexpected warmth and humour, Ghachar Ghochar is a quietly enthralling, deeply unsettling novel about the shifting meanings – and consequences – of financial gain in contemporary India. This book has captivated me from start to finish. The writing was beautiful and it was very interesting for me to see how the main character’s family changed once it got rich! I also think that the translation has been done so neatly and greatly that it still managed to convey the essence of the story that was told in its original version. It doesn’t always happen but in this one, it really didn’t feel like anything was missing. The great thing about this book is that every little thing matters. It’s a very short book where if a thing didn’t add something relevant to the story, it just got left out. I found out about this book once I saw Ariel Bissett rave about it on her channel and since I usually love her recommendations, I was glad I managed to find it on Netgalley and even more once I got approved for it. Speaking of Anita, she probably is my favourite character in the book. There was a moment where she was the only one who stood up for another woman and gave her the benefit of the doubt while everyone started treating her badly. That was the moment where I knew she was my person in the book because I had felt so bad for this poor woman that it made me pause to gather some more courage and see what happens to her. Anita spoke up and wasn’t afraid of the family’s reaction and that alone made her a hero. Anita isn’t our only hero. I also liked his first girlfriend. In the beginning of the book, he talked a bit about his first girlfriend that worked in an organization that helped women that were violently attacked by men and that came each time and told him about all the cases she saw throughout the day. Our narrator sure has a type! Although I loved the book, our narrator is a character that I loved hating. I really have a thing against people who accept money without working for it and that’s what he kept on doing. It was convenient for him and that reminded me of how once, I was in a cab and there was a man in a very similar situation that was basically saying that it was too stupid to work if you had an easy way to an income. I absolutely hated hearing him talk in those 5 very long minutes. He didn’t even try that hard when Anita has pointed out that it wasn’t the way to go which made me feel real sorry for her because she deserved way better. I also loved the ending because it doesn’t actually give you an “ending” but rather leaves you with a series of questions that get stuck to your mind and that you need t reflect upon. I would highly recommend this book to anyone who’s looking for a short read that’s packed with intense moments. This book was provided to me by Faber & Faber and NetGalley in exchange for an honest review. I’ve know about the Booktube-A-Thon for a while now but I didn’t know if I was allowed to participate as a non-Youtuber but right now I’d take any occasion that will motivate me to read more before starting my new job. Luckily, the week of the booktube-a-thon will be my last free week and so I hope I will take full advantage and read as much as I can! The challenges seem like a lot of fun too! I’m so excited to be part of this! Thanks to my exams, I haven’t been able to read so many ARCs that I have received so I guess this is my chance to read em aaaall! Therefore I present to you my full-of-ARCs TBR for the Booktube-A-Thon! The Leavers by Lisa Ko. I am already halfway in and might finish it before the start of the Booktube-A-Thon and so not to be “cheating”, I’ll add in another book and that would be City of Saints and Thieves by Natalie C. Anderson. Okay so if you’ve read my review of The Accomplished Guest, you’d know that my last experience with short stories was a disaster but I am not going to give up on them altogether since I’ve previously very much enjoyed Ali Smith’s short stories. For this challenge, I’m picking up The Purple Swamp Hen and Other Stories by Penelope Lively. What We Lose by Zinzi Clemmons. I didn’t know how different exactly are we talking here. For now, I have chosen What We Lose because the main character is African-American living in Pennsylvania and even though I suppose it doesn’t seem crazy different buuuut I am really interested in reading this book asap sooo yeah! And that’s it for my very ambitious TBR! I would like to mention though that in case I do not complete this TBR, there are some books that could fit in other challenges as well so I might not stick with a book for the category I put it into in the first place. In other words: I might still change this because I’m the worst at TBRs. Absolute worst! 🙈 Like just yesterday, I was planning to finish The Leavers but I’ve decided to start A Court of Mist and Fury on a whim and now that’s what I’m reading and I’m surprisingly not regretting my choice!! Have you guys decided to participate in booktube-a-thon or in any other readathon? If so, what is it you’re planning to read and what are you most excited about?